- Publisher This powerful book has touched countless lives--reminding readers of the Lord's invitation to "come away" and experience His all-sufficient care and provision. A book "forged in the crucible of life," Come Away My Beloved shares the ministering spirit of the heavenly Father to those in need of encouragement, hope, comfort, and conviction. Equally helpful to new Christians or long-time believers seeking spiritual renewal, Come Away My Beloved offers instruction for successful Christian living and inspiration for deeper devotion to God. This classic book has been updated for ease of reading and incorporates Scripture from the New King James Version. About "Come Away My Beloved"
This powerful book has touched countless lives--reminding readers of the Lord's invitation to "come away" and experience His all-sufficient care and provision. A book "forged in the crucible of life," Come Away My Beloved shares the ministering spirit of the heavenly Father to those in need of encouragement, hope, comfort, and conviction. Equally helpful to new Christians or long-time believers seeking spiritual renewal, Come Away My Beloved offers instruction for successful Christian living and inspiration for deeper devotion to God. This classic book has been updated for ease of reading and incorporates Scripture from the New King James Version. 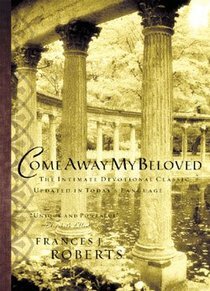 Customer Reviews For "Come Away My Beloved"
This is my current devotional - a classic by Frances J Roberts updated in today's language for a modern reader. Note that the writing is still quite traditional and sophisticated, but absolutely understandable and absolutely readable. Each short page or so is usually preceded by a verse, and then often continues as a short passage from the perspective of God speaking to you, His beloved. This was what I so loved about 'Come Away My Beloved' and set it apart from other devotionals I had browsed - the tone is incredibly intimate and personal. Like love letters from an almighty God, this devotional is one that you will keep by your side always and treasure forever. The size is very convenient also, and I find the simple imitation-leather covering to feel very sturdy and beautiful. If you are feeling disconnected or disillusioned, this is a book that will really speak to you - just you - directly... with Love, with Power and with Grace.